Strengths: Cinder is perhaps the most mobile character in the game. In addition to an excellent backdash, many of his special moves can be activated from the air or the ground, including Trailblazer, a move that gives him access to 8-way airdashing and close-range mixups. Cinder's toolkit is stuffed to the brim with powerful but situational tools which reward a lot of creativity in movement, pressure, and combos. His burnout enders allow him to neutralize the opposing character's most utilized tools, punishing stubborn opponents for huge amounts of damage, and his Third Degree target combos mixed with special moves create havoc on impatient defenders. Weaknesses: While the aggregate of Cinder's moveset is strong, each individual move has a rather particular purpose, making Cinder a fairly advanced character with a somewhat non-obvious gameplan to beginners; Cinder's potential requires practice to unlock. With slightly below average normals in the mid-range, no grounded overhead, and situationally unsafe on block special moves, good defenders with knowledge of Cinder's mechanics may be difficult to open up. His combos do well below-average damage, which means Cinder typically relies on large potential damage cashouts from burnout enders and shadow Inferno to make defenders nervous. If you're unable to get that next hit needed to cash out the damage in time, Cinder will struggle. Notes: Cinder's punch auto-doubles are faster than his kick ones, and Inferno linkers are marginally faster than Fission and Trailblazer linkers, although they all seem to do roughly the same damage. If you're having a hard time doing Inferno linkers because you commonly move to up-back and get a premature Fireflash ender, you can replace the no-meter punish with three light Fission linkers for the same damage. The 1-meter punish is quite particular and does a good 3-4% higher than his next best; it uses the fact that Inferno is a faster linker and that shadow Inferno can raise the ender level to 4 without extending too far past the lockout window. Shadow Fireflash does quite poor damage as level 4 ender, so the meter is best spent on shadow moves mid-combo. You can swap the shadow Inferno and the shadow Trailblazer in the 2-meter punish and get the same damage, depending on how easy you find the execution. that is dependent on the combo's ender level. The opponent's upper or lower body will be visibly ablaze and he will start to take potential damage at a constant rate until the burnout ends. Burnout enders by themselves do virtually no damage, so Cinder is trading immediate damage for potentially greater rewards in the future. Burnout enders will also transfer over between rounds. Cinder performs a Level 1 punch burnout ender on Jago, which will last 3 seconds. If Jago performs any punch normal or special move, he resets the burnout timer. After the full duration passes, the burnout ends and the potential damage begins to heal. There are only two ways to remove this burnout state: either perform a combo breaker or wait for the timer to run out. Hitting Cinder will have no effect. Performing a combo breaker has the added benefit of instantly healing all your potential damage, as all combo breakers do, whereas if the timer runs out naturally, you must wait additional time for the potential damage to naturally heal. Unfortunately for Cinder's opponent, the burnout state can be extended, termed fanning the flames, by performing certain actions. If your upper body is burned out, performing any punch normal or special will fan the flames, whereas if your lower body is burned out, performing any kick normal or special will fan the flames. It is possible to have both your upper body and lower body in a burnout state, if Cinder is able to land multiple combos quickly and performs each burnout ender. If this happens, each burnout is governed by its own separate timer, and the potential damage accrued will stack. Actions such as movement (walking or jumping), moves that require both a punch and a kick (throws, teching a throw, activating instinct), or pressing buttons that are not burned out will have no positive or negative effect on a burnout timer. If you press a burned out button and fan the flames, the fire on your body will flare up noticeably, and your burnout timer is reset to its initial value. This is particularly devastating if you were initially hit with a level 4 burnout ender, because the full 7.5 seconds will start anew. The purpose of the burnout ender is to convince you to stop using certain tools associated with the particular set of burned out buttons for a short amount of time. You may, for example, choose to burnout Jago's punch buttons so that he cannot perform his normal set of anti-airs, making air approaches easier. Or, if you notice your opponent likes to approach with Jago's wind kick, perhaps you'll choose to use the kick burnout. Certain characters might be more negatively affected by having their punch or kick buttons burned out, so analyze which of your opponent's most common moves you would like to penalize. If you get burned out by Cinder, I cannot stress this enough; you must stop pressing the burned out buttons, including during combos, until the burnout ends. While there may be rare situations where you are willing to accept your burnout resetting, such as near the end of a round, most of the time you will simply increase the amount of damage Cinder's next ender cashout will be, and you may find your entire health bar full of potential damage in no time at all. Fortunately, most characters will still be competent fighters with their non-burned out buttons, and simply playing solid defense and waiting for the timer to expire is recommended, since Cinder is not equipped with a grounded overhead or any particularly overwhelming mixup tools. Unless Cinder can apply another burnout ender to you, your potential damage will gradually heal and you will often be not much worse for wear. If the fire on Cinder's body is more brightly lit, this indicates that he is fired up. The next non-shadow special move he uses is enhanced in a unique way, which means Cinder has three variations for every special move; a normal version, a fired-up version, and a shadow version. Cinder automatically spends his fired up charge with the next non-shadow special move he uses, and 8 seconds later, he will become fired up again. This 8 second timer ticks down in all phases of the match, including if Cinder is getting hit and between rounds. Let's take a look at each fired up special move. Fireflash: After Fireflash, a pillar of fire is summoned in front of Cinder. If the pillar is blocked, Cinder is at -6 disadvantage. If the pillar hits, Cinder can follow up with a combo. There is a gap between the Fireflash and the pillar if blocked; opponents can choose to do a projectile invincible move through the pillar rather than try to punish directly. Pyrobomb: The bomb is visually larger and produces a larger explosion which does more damage and launches the opponent higher. Inferno: Range is greatly increased, reaching nearly full screen. Trailblazer: Can perform an additional Afterburner for three total Trailblazers. Fission: A much bigger explosion, and frame advantage on hit and block is greatly increased. Slightly more damage. It is pretty difficult to control when you are fired up, so it is more natural to react to the situation you're in and adapt to the special move you were planning to use, rather than deliberately saving your fired up state for a situation in the future. Fired up Pyrobomb allows for some combos that aren't normally possible, while fired up Trailblazer increases mixup potential and movement options. Fired up Inferno's added range makes it a fantastic mid-screen footsies tool, especially the heavy version which hits low. Fired up Fission is potent during your frame trap pressure; take note if your fired up state regenerates right before a Fission attempt and assert your frame advantage in a situation where the opponent might think he is free to attack. Perhaps the most common fired up move is Fireflash, especially since if you have been comboed and are planning to use a reversal attack, you are unlikely to have used special moves in the last 8 seconds. If you block the pillar after fired up Fireflash, Cinder is -6 on block, which means every character should be able to punish with one of their 5-frame light normals and start a grounded combo. In practice, if Cinder is at range, it might be difficult, and the block stun on the pillar is rather short, so you will probably need to practice this important punish in training mode a bit. It is also possible to interrupt Cinder in between the Fireflash and the pillar, which may be preferable in some cases, but requires faster reactions. Cinder has two primary combo openers that complement his highly mobile neutral and his up-close pressure, the two tenets of Cinder's gameplan. Trailblazer is Cinder's main mobility tool and is usable in the air as well as on the ground. He turns into a human flame and fires in one of three primary directions (light goes up-forward, medium goes forward, heavy goes down-forward). Cinder can further cancel Trailblazer into a second Trailblazer (called Afterburner) by steering in any of the 8 primary directions and pressing kick again. Whenever any Trailblazer hits, from the air or the ground, a combo of some form results. If your Trailblazer or Afterburner finishes on the ground, it acts like a standard opener. If it finishes in the air, you will be able to continue the combo with a jumping attack before landing and starting a ground combo. From point blank range, the forward-moving medium Trailblazer is quite unsafe on block, but if well spaced from far away, it will be difficult to punish Cinder. When you're not darting around the screen with Trailblazer, Cinder's Fission special move is an excellent close-range pressure tool similar to Giant Palm Bomber from Street Fighter's Hugo. The light version is a fake-out, so it does not act as an opener, but the medium and heavy versions do, and have different uses. Medium starts up faster, such that it acts as a true block string or natural frame trap after many of Cinder's close pressure strings (see the Normals section below), but medium Fission is -2 on block, so Cinder relinquishes a bit of pressure if the opponent is patient on defense. Meanwhile, heavy Fission starts up considerably slower, such that there is a large gap where Cinder can be interrupted after any pressure string, but is +5 on block and Cinder can continue his pressure unabated. On hit, both medium and heavy Fission start combos like all openers, and the heavy version is an amazing +14 on hit, so heavy manuals will connect effortlessly. Cinder's goal here is to mix up between the fake light Fission which lets Cinder perform surprise throws, the medium Fission which catches button presses, and the heavy Fission which can be interrupted but will generate large frame advantage if the opponent has been carefully taught to block. Cinder often starts combos with juggles as well as standard ground openers. If you hit someone with a Pyrobomb explosion, and you're close enough, you'll be able to juggle them before they land; this is perhaps most common if you land a throw, then detonate Pyrotechnics. Note that Pyrotechnics can hit opponents while they are knocked down, so you can let the throw complete for its full damage and then detonate the bomb to start the combo. Fired up Fireflash's pillar will launch for a juggle with similar timing, and is a common combo starter because of the strength of this reversal attack. Inferno is not a standard opener, since you cannot cancel it into auto-doubles, linkers, or perform any manual after it. But it is cancelable into shadow moves, even from very far away, which will let you start a combo by regular means. It is particularly common to cancel Inferno into shadow Trailblazer on hit, since it will work from maximum range easily. Because Cinder's combo damage is below average, most of these linkers are fairly interchangeable. Trailblazer pushes towards the corner, but performing manuals after Trailblazer linkers is awkward because the timing is incredibly early. Meanwhile, the timing to manual after Inferno is similar to Jago's Laser Sword, and the timing to manual after Fission is similar to Jago's Wind Kick; this familiarity will make help make manual combos easier. Inferno is the fastest linker, so it is best used in lockout situations, but be careful you don't extend your backwards quarter circle to up-back, because you will inadvertently trigger a Fireflash ender. Both Shadow Fission and Shadow Inferno are long linkers that follow the common 6 on, 2 off pattern, and you only need to break three hits like all shadow linkers. Shadow Inferno has a shorter shadow freeze compared to Fission, but the hits perfectly line up along the timeline; this just means that Shadow Inferno is more likely to lock you out after the freeze ends, as there is a period where Cinder is visibly waving his hands but no break window has yet become active. Shadow Trailblazer's steady rhythm also makes it fairly simple to break. As far as damage is concerned, Inferno's extra two hits often contribute enough white life to increase the ender level, which makes it an important shadow linker in counter breaker punishes (see the top of this page for exact combos). If you have to maximize a surprise lockout, Shadow Trailblazer is much preferred over the others for its considerably shorter total duration. Cinder is a capable fighter without shadow meter, so while the battery ender is certainly helpful, the penalty of relinquishing his spacing and pressure might not be worth it unless your opponent is near the corner, or you are planning to fight at range. His burnout enders are strong aspects of his game that should be used frequently; check the top of this page for a full description of how they operate. You should identify which buttons your opponent likes to press and burn out those buttons first, and see how willing they are fight without pressing them. If they continue to use them, the burnout timer continually resets and soon you will find yourself with an opportunity to win the entire life bar with a single opening. Certain characters may really struggle without access to a particular set of buttons (such as Aganos's punches, or Tusk's punches), whereas other characters it will depend largely on your opponent's playstyle; for example, does this particular Jago prefer having anti-air punches, or Wind Kicks? Once they have sufficient potential damage from burnout enders or other sources, your next combo can cash it all out with Cinder's damage ender, Fireflash. As a special note, if Cinder is Fired Up, he can cancel his throw into a level 1 Burnout Ender. The timing to do this is the same as canceling throw into Pyrotechnics, and the input is the same as the standard Burnout Ender of your choice. It will spend your fired up state, but it is useful if your opponent is cornered and you cannot convert the throw into more damage from a Pyrobomb. Cinder performs more air juggles than perhaps any character in the game. He is often able to perform damaging juggle combos without needing recapture, but Cinder will often attempt to recapture using his air command normal Crossfire. It is always breakable with heavy attacks, and you will have a fairly long window to break if you see it, so as a defender you will have to decide whether to wait for Crossfire as an "obvious" break point during a Cinder juggles, or if Cinder will cash the damage out with shadow Fireflash without ever attempting to recapture. Even if Cinder does include Crossfire in his combo, he can always take a risk and counter break it. Cinder becomes permanently Fired Up when activating instinct, which he can do on the ground or in the air. This is fairly substantial for all aspects of Cinder's game. It enhances his zoning, as Pyrobombs do more stray damage, and the threat of having one attached to you makes post-throw combos more difficult to break. It greatly impacts his mid-range game, as Inferno reaches farther and is now a half-screen low attack, and Trailblazer becomes much more difficult to pin down with the potential of an extra Afterburner. It makes his reversal game stronger, since all reversal Fireflashes that connect will lead to a combo, and all reversals that are blocked will test your opponent's punishing skills. It also greatly enhances his pressure game, since all Fissions will have similar frame trapping potential but will all be much more positive on block; the medium Fission, normally -2, becomes somewhere in the +3 range, while heavy Fission is close to double-digit advantage on block. Opponents will have to block for a long time, or else guess correctly on a shadow counter opportunity, to escape repeated fired up Fissions. Unfortunately for Cinder, if you try to do a reversal Fireflash and instinct cancel, you will not be able to activate until Cinder is in the air, which means he is still likely to be punished since he cannot immediately block like other characters after instinct canceling their reversals. Cinder has a couple good grounded normals, but his repertoire is not as expansive as others. Crouching HK is a decent long-range sweep, while crouching MK and standing MK should be your main mid-range pokes, which can be canceled into Trailblazer or Inferno. Close standing MP is a good button when you don't want to use Third Degree chains (see below) for up-close pressure. If you want to anti-air with a normal instead of Fireflash, crouching HP works, and is jump-cancelable into a combo (note that crouching HP, directly into Crossfire is not combo breakable, leading to good damage and a grounded combo). Because Cinder has such good air mobility, his air normals are noteworthy. Jumping MK and HK are both good crossups; jumping HK is particularly good when descending from a light Trailblazer behind your opponent, since it hits from considerably farther range and gives you the block or hit stun of a heavy attack to work with. Perhaps his most important air normal is Crossfire ( + HK), an air command normal that causes Cinder to do a backflip and strike the opponent with his heel, recapturing them. Many of Cinder's combo openers (fired up Fireflash, throw + Pyrobomb) launch the opponent into the air, so this recapture helps him convert into burnout enders and other tricks. As described in the Recapture & Flipout section, this attack is easy to spot and break, but you will have to play the counter breaker game with Cinder each time. Crossfire is not an overhead, but it sends Cinder flying to the ground like a dive kick would, which means jumping and doing it instantly can be used as a fake out for Cinder's other mobility tools. If you happen to connect with Crossfire, you can easily hit-confirm with any manual of your choice, due to the high hit stun on recapture moves. You can also cancel other air normals directly into Crossfire. This means you can meet someone with a fast air-to-air normal, such as jumping MK, and immediately input Crossfire to convert to a full grounded combo, or make combos and pressure harder to deal with by putting other normals before Crossfire. Lastly, Cinder has access to a variety of close-range target combos called Third Degree chains. In essence, you can press any three standing punch buttons in a row, and they will chain into each other, even on whiff. They form a strong core of Cinder's close-range pressure, and we can categorize them into a few easy-to-use sequences. Third Degree chains ending with LP are +1 on block, and canceling into medium Fission is a true block string; alternatively, performing no cancel or stopping the target combo after just two button presses will lead to strong throw mixups and prevent easy shadow counters. LP LP LP is an excellent target combo that has short range, but is fast and can start Cinder's offense. Chains ending with MP are marginally negative on block, move Cinder forward a bit, but do not put your opponent in as much block stun; this means canceling into medium Fission leaves a one frame gap which will trap any button or throw your opponent tries to press. LP MP MP, or MP MP MP are both strong chains for this reason, and this technique is so effective to stop button mashers that you can win entire matches by canceling a medium Third Degree chain into medium Fission. Third Degree chains ending with HP are terribly unsafe on block, but will launch your opponent on hit. You can use a chain in the middle of a combo to launch your opponent for maximum style and added break difficulty, but in general they are not effective as grounded pressure. Using Third Degree chains ending with LP and MP, and mixing up your cancels between all three Fission versions (or no cancel at all) will be very difficult to defend against. Just know what you want to do: if you're trying to beat a person who likes to press buttons, do a medium chain into medium Fission to create a gap. If you're trying to beat patient blocking, do a light chain and use heavy Fission for massive block advantage, or throw them by doing the fake light Fission or no special cancel at all. Fireflash is Cinder's invincible reversal. The light version is fully invincible but has the shortest range, while heavy has great horizontal range but no invincibility at all. Fireflash is fairly slow as reversals go, with 9 frames of startup, and there is no hitbox until Cinder is in the air, which means certain grounded normals and specials can low-profile it or out-prioritize it. Additionally, it doesn't have great coverage around Cinder's head, which means ambiguous crossups will often cause Cinder to flip underneath; in this instance, even the pillar from the fired up version will miss the opponent and Cinder will be open to huge punishment. Trailblazer is perhaps the most complex move in the game, and it will be impossible for me to list all its applications in a reasonable format, so let's just discuss briefly some properties of the move. It is basically a mobility tool that acts as a combo starter on hit and can be canceled off normals to send Cinder behind, into, or above opponents for all sorts of unique offensive pressure. If Cinder slams the ground with a Trailblazer or an Afterburner, he will leave himself -3 on block, which will let some characters with 3 frame special moves punish him outright. If Cinder uses Afterburner to go up-forward against a grounded opponent, he can recover and press air normals to create tick setups, and also air specials in case he wants to detonate Pyrobombs, but be warned that there is a gap between Trailblazer and air normals that smart defenders can interrupt. And, of course, Cinder can also use Afterburner to retreat from a blocking opponent, and all of this can be done from the air as well to approach from interesting angles, or extend any air combo. If this complexity sounds interesting to you, jump into training mode and explore the potential of this move, or check out creative applications other people have found (for example). Pyrobombs are Cinder's zoning tool, and he can throw them at three different angles, including from the air. By themselves, they do no block or hit stun, but Cinder can detonate the bombs (called Pyrotechnics) remotely by pressing all three punches, and if they touch an opponent, they will stick to them for 8 seconds before they fizzle out harmlessly. Hitting Cinder will also remove all Pyrobombs he has in play. Detonating a Pyrobomb actually does surprisingly little regular and chip damage (although the Fired Up version is much better), so they are mostly used as an annoyance or a reaction punish if a stickied opponent is jumping or doing unsafe moves. The real threat from Pyrobombs is that Cinder can cancel his throw animation into Pyrotechnics; if an opponent has been stickied with bombs, Cinder's throws become much more dangerous. The explosion will pop the opponent into the air (the height of which depends on the number and power of the bombs), allowing for fancy air combos of varying length and complexity, but likely at some point containing a Crossfire to recapture and cash out the damage. If your opponent is waiting for Crossfire to combo break, and you don't want to risk a counter breaker, there are certain combos you can perform that end in a shadow Fireflash juggle which will cash out the damage without any recapture needed. Lastly, let's talk a bit about the shadow versions of Inferno and Fission. Regular Inferno is an interesting move because it does no chip damage; instead, it does a large amount of potential damage on block. A regular Inferno canceled into shadow Inferno does an absolutely enormous amount of potential damage on block, and is truly safe on block and safe from shadow counter. This is one good use of shadow meter, but be warned that there is a gap that can let projectile invincible moves sneak through (the input to blow through the shadow Inferno must be entered after the super freeze). But because most characters need meter to get access to this, if you can pin down a character without meter, they mostly just have to take the potential damage and hope to survive until it heals. To complement this, Cinder has shadow Fission, a move which does an immense 8% chip damage on block, but starts up incredibly slow and can be easily interrupted by attacks if done raw. However, canceling Fired Up medium Fission (or any heavy Fission) into shadow Fission is a true block string, meaning no reversals or escape is possible, except some situational shadow countering. This is a fantastic use of meter, especially to close out rounds without needing to land a hit. One way to set this up is to cancel Cinder's LP LP LP Third Degree chain into Fired Up medium Fission; in instinct, this is especially good because all Fissions will be Fired Up. Additionally, if you manage to catch an opponent without shadow meter, you can easily set up a perfectly meaty shadow Fission after certain knockdowns, like a throw; if they don't have a way to travel out of the way of the explosion, they will get hit, and shadow Fission is massively plus on block and safe from shadow counter. So, is there any way to make sense of all the text on this page? Cinder has a lot of very strong tools, but so many of them are situational. Some ideas are good only if your opponent doesn't have shadow meter, while others will require different adjustments depending on your opponent's punish capabilities and his tendencies to press buttons or block. Cinder's walk speed, forward dash speed, and mid-range footsies buttons are somewhat lacking, which means the main way you will create offense is with your mobility. You can stick opponents with Pyrobombs without giving up space by performing the move in the air, and then you will likely close the distance with some form of Trailblazer approach. Trailblazer is such an interesting move, both in pressure and during approaches; no two Cinder players will use the move alike. If you're looking to begin experimenting with the move, I would recommend you try doing grounded light Trailblazer from around sweep range (perhaps canceled off crouching MK), and come down behind your opponent with a jumping HK crossup. To mix this up, sometimes execute medium Trailblazer, and then mix up between Afterburners that go up-forward, down-forward, or away from your opponent. Each of these approaches has answers on defense, but Cinder is fast enough that even good defenders will likely struggle to keep up. Once your opponent has blocked your approach, Cinder should begin to use his incredibly strong Third Degree chains into Fission mixups until the defense guesses correctly or gets hit. If you are being predictable and your opponent begins to shadow counter your chains, you can begin to execute only two of the three hits in a chain, or throw more often; if you put a Pyrobomb on your opponent during your approach, this throw will lead to a combo, and if not, the throw knockdown will give Cinder time to throw a heavy Pyrobomb which will land on an opponent as he stands up, setting up your next throw. If you get pushed away slowly during your Fission pressure, you may decide to spend a meter on something like crouching MK into heavy Inferno into shadow Inferno to put the threat of a level 4 ender on your opponent. And be sure to frequently use burnout enders to limit use of your opponent's most dangerous buttons to give Cinder an even stronger advantage during his pressure. 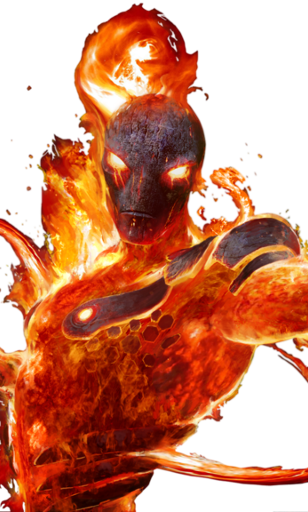 Cinder brings a unique combination of mobility, close-range pressure, and arrogant personality to KI, and he is a wonderfully complex and exciting character to play. Show me an enigmatic CEO.